One of the enormously popular solitaire games included with Windows, FreeCell is a game that requires skill and patience to win! After dealing from a standard deck of 52 cards, use the four free cell spots as placeholders as you try and move all the cards to the Foundation stacks for a win. Unlike many solitaire games, all the cards in FreeCell can be seen at the opening deal, so most FreeCell deals can be solved, if you have what it takes! 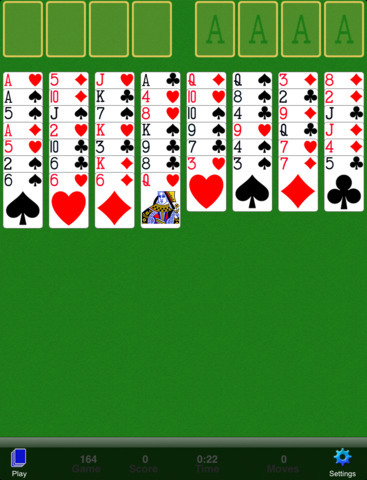 You’ve played FreeCell on your computer, now you can play FreeCell anywhere at any time of the day! 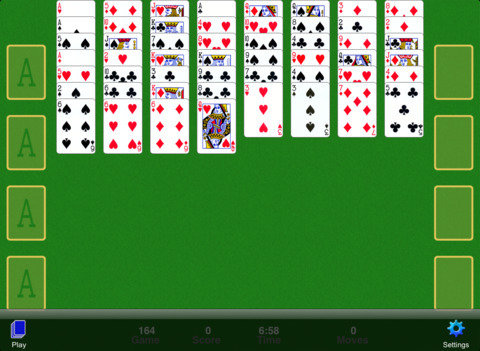 FreeCell Free can be played on the iPhone, iPod touch, and in high definition on the iPad! And with crystal clear graphics and an easy-to-navigate interface, you won’t want to play any other FreeCell application again! Features supported include your choice of Tap-To-Move or Drag-And-Drop game play, and options to keep track of your statistics. Beautiful classic card faces are supported when playing on the iPad. We’ve included another update to give you the highest quality game experience with FreeCell Solitaire.